Christians have a very serious relationship with our dead ones. We often speak to them and we continuously talk to God about them. To be more precise, for us, these who have left their body are not dead but alive (metaphorically we call them “sleeping” and this is the way we regard them, as living, who have simply left and live in another place. 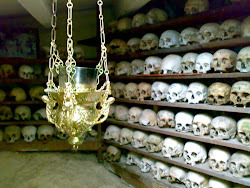 The place were we bury their bodies is called “cemetery” (from the greek word “κοιμητήριο” = sleeping place). On the contrary, we consider dead those people who have taken God, His love and His grace out of their heart, no matter if they live among us or have moved to the place of the souls. This is the real death, the eviction of God from our heart, whereas when we allow Him to enter our heart we are fully alive, either here, or at the place of the souls. When we say that God enters our heart, we do not mean that he takes control of us and removes our spirit and abolishes our freedom (God never does that, only devious spirits do that). We mean that God’s grace comes into us (His life-giving, uncreated, eternal and luminous energy) and transforms us bringing us closer to Him. This transformation is closely related to the sacraments of Christian Church, as we will see shortly. God willing, we will now see what we know about the dead, or “departed”. 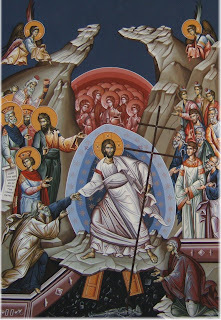 When Jesus died on the cross, His human soul transferred to the place of the dead (”Hades” in Greek), where it talked to the dead, as it had done to the living (one might want to see the relevant orthodox icon “Descent to Hades”, as well as the testimony of great and saint apostle Peter, Jesus’ disciple, in his first epistle (letter), found in the Holy Bible, chapter 3, verse 19-20). He then took the souls of the dead from Hades and brought them to the place where souls go now, a place called “heaven”. 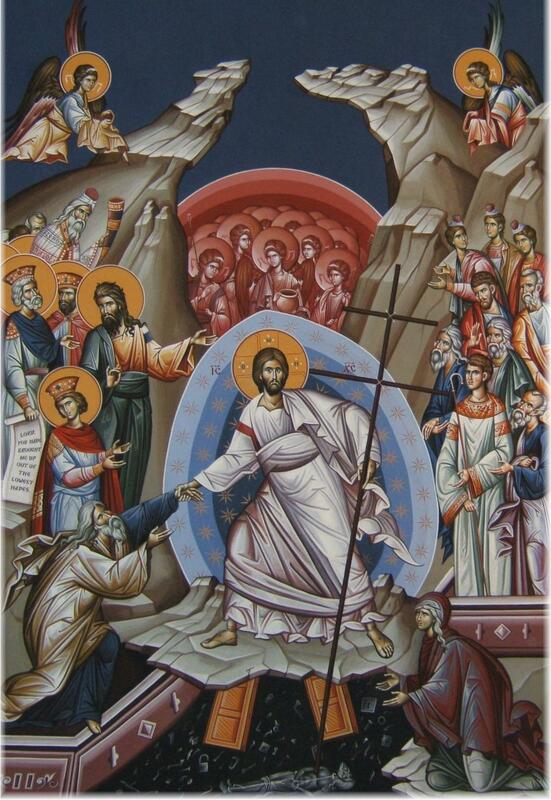 There, the souls of those dead before Christ together with the souls of the people who lived after Christ, wait the resurrection, so that they will live in God’s kingdom assuming their bodies again, but this time as immortal and luminous bodies. The people who lived in this world having advanced towards God with pure heart, foretaste in heaven – the place of the souls – the indescribable happiness generated by the relationship with Christ, by the sight of His heavenly beauty and His uncreated Light. This happiness is proportional to their kindness and will reach its full extent after the resurrection of all people. We call this happiness “paradise”. On the contrary, those who lived in this world confining their love to their egoistic self, foretaste in heaven the grief generated by the relationship with Christ (whom they do not love), by the sight of His heavenly beauty and His uncreated Light. This grief is proportional to the distortion caused by their egoism and will reach its full extent after the resurrection of all people. We call it “hell”. A reference to the resurrection and to the final state, in which all people (of all races and ages, as well as of all religions) will live, is found in the words of Christ himself, in the Gospel of Mathew, chapter 25, 31-46. This description must be considered in the context of God’s love for all people and for all creatures. God does not “send to hell” the impenitent sinners, but the state of their own soul is itself the hell. The state that does not allow them to taste the indescribable happiness of paradise. 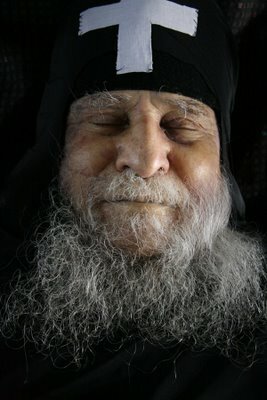 Elder Joseph of Vatopedi (in Holy Mount Athos), smile after death (here). By becoming human, Christ united with the human nature and offered to every person the ability to unite with Him. But because Christ is also God, the person who unites with Him at the same time unites with God. Thus, the union with Christ makes a person “holy creature”, in other words, Saint. We know from the experience of all generations of Christianity, and especially from the experience of our Holy Teachers, that to unite with Christ just being “good people” is not enough, but holy grace is required, this is why the holy sacraments were delivered to us (baptism, confession, holy Communion, e.t.c. ), with which a person properly prepares oneself and calls God to send him His grace. Every simple person, accepting God’s grace inside him and responding to it by loving God and his fellow people and forgiving those who want to harm him, or have already done so, approaches God so much, as much as he has progressed on that road. He becomes, that is, “little saint” (=he receives a little holiness). Whereas, those who have progressed farther in that road and reach to the point to love God and the others, even their enemies, much more than they love themselves, are the real Saints, those who are often granted from God the gift to perform even miracles. The fervent, sincere, and persistent prayers of people to the true God are accepted at the time and in the way that He wants. The prayers of the Saints are more accepted, not only while they live here, among us, but also when their souls have departed to heaven and are foretasting paradise. This is why, when God reveals that a departed christian is Saint, we speak to him (through our prayer but also with the church ceremonies performed at the day of his remembrance) and ask from him to pray to God for us and for all the world. Also, we apply to him by painting his icon or dedicating a church to his name. There are innumerable cases, that reveal that the saints respond from heaven and answer our prayers. This is what I meant above, saying that we often speak with our dead. God has many ways to reveal that a person is Saint: for example, his bones may release scent or even sweet oil (holy scented oil) or people may be cured from illnesses, or other miracles may be performed through his bones. The Saint may appear in dreams or visions to people with clear heart, e.t.c.. Of course, in all such cases we must be alert to make sure that these revelations are true, because it could be a hoax or an enemy trap, meaning a trap from devious spirits, who want to mislead people and make them their followers. When it is certain that this is a true revelation of a Saint, the Church includes the Saint officially in the calendar and assigns a day dedicated to his memory. Usually it is the day the Saint passed away and is called “birth day”, as if that day the Saint was born in heaven. 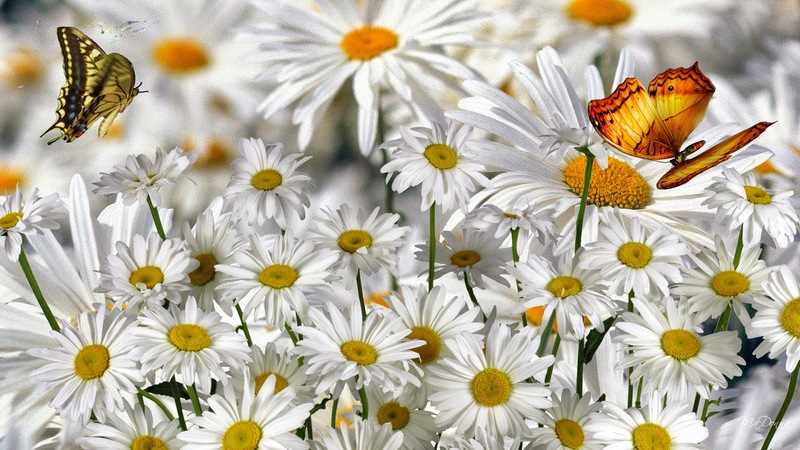 The existence of Saints and their interventions in our life from heaven prove that there is no reincarnation, and that the souls will never “perish”, but the souls of people are eternal and remain always the souls of the specific persons, with the specific name, personality, memories, feelings, e.t.c. And will remain so until they are resurrected, assuming again their body, incorruptible and eternal, to live eternally as psychosomatic beings, without dying never again. Even someone who is not an important and miraculous Saint, but whose soul is clean and foretastes paradise, can help living people by praying to God about them. 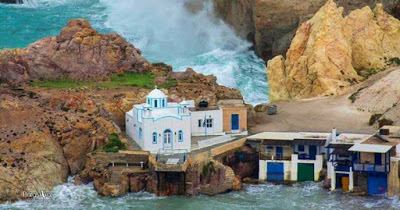 One such case is recorded in Evergetinos, an ancient orthodox book, where an unknown dead person (obviously having a foretaste of paradise) appeared and cured the injured leg of a traveler, who had found his body lying on the road, and had buried it. The people who foretaste paradise see our own world, because paradise is the strongest relation with all beings. But people who foretaste hell do not see our own world, because hell is a state of solitude, since the egoism of those people essentially isolated them eternally to their own self. We do not worship the souls of the dead, because we know that only Triadic God we must worship. The souls of people, as we are taught by the Holy Bible and by all the holy christian teachers, are not from the same substance with God, but are God’s creations, created from nothing, like our bodies and all the material and the spiritual world are. Only the Holy Trinity is uncreated. The Father bears the Son before all ages, and proceeds (=sends out) the Holy Spirit – He brings Them into existence through His substance, He does not create Them. On the contrary, He creates the souls when a person is conceived inside his mother’s womb. So, the souls are not divine. They are what we, living people, are: God’s creations who worship God and only God. We love people, regardless if they are here or in heavens, we pray to God for them or address them, if God has revealed that they are Saints, but we do not worship them. We do not worship Saints either. Only God we worship. So, when a person departs from this world to go to heaven, we immediately start to talk to God about him. In this way we try to help the state of his soul, so if it was not good enough to foretaste paradise, we may comfort it with our prayers. Since hell is associated with total loneliness, it is not strange that living people’s interest for the souls, if fervent, sincere, and persistent, has the power to alleviate this loneliness and bring relief to the state of those souls. We know from holy christian teachers that the fire mentioned by the soul, is the Light of God, which illuminates everything in the other world. The sensation experienced by those who see This Light through the distortion of their egoism is described as “fire of hell”. 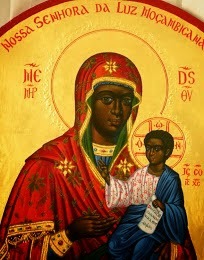 St. Macarios of Egypt was so good that when a young woman, who was pregnant by some secret lover, falsely accused him that the child was his, he accepted the accusation, suffered all kinds of insults from the local people and started to work double, in order to support the woman and her child. And when later the truth was revealed, he left secretly and never tried to clear his name. Also, the case of Saint Gregorios the Dialog (as well as other cases) prove that the fervent, sincere, and persistent prayer of living people for the dead has the ability to even convert the state of a soul from hell to paradise, at least when that particular soul has the required preconditions for this conversion (that is, if the soul is not totally corrupted). The Saint prayed fervently, “shedding rivers of tears”, for the salvation of the soul of the Roman emperor Traianos, when informed of an action of charity that he had performed. And later, he was informed by God that his prayers were accepted. Of course, all of us hope that the souls of our beloved are in the state of foretasting paradise, but only for the Saints can we be sure. So, as already mentioned, when a person’s soul departs from this world, we immediately start to talk to God about that person. In other words, we immediately start to pray. For us, all people are equal, therefore the following apply to everybody: men, women, or children, irrespective of their social status. 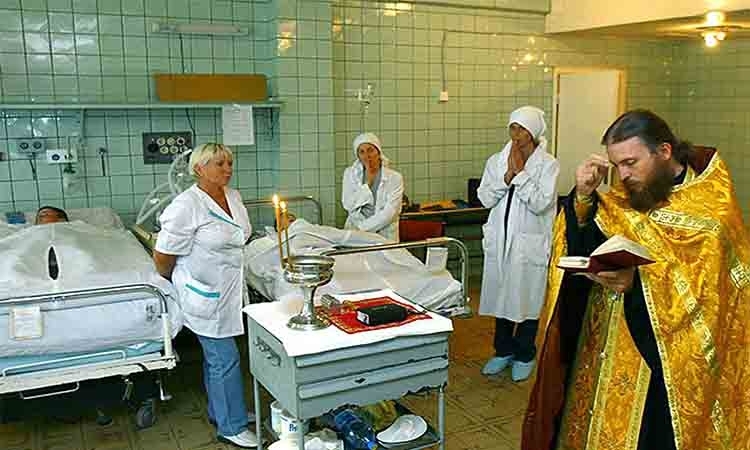 If that person is not an orthodox christian, the only thing to be done is our personal or team prayer for him, which may be accompanied by fasting or some other small or big sacrifice, which will make our heart cleaner and in this way more appropriate to send our prayers to God. We do not perform for him any “official” ceremonies in our churches, because the first step and the necessary condition for these ceremonies to be effective, is the holy baptism in the name of the Holy Trinity. The holy baptism “transforms” the person to the “good olive tree”, to the “real grapevine”, to Christ. Therefore, in the absence of baptism, we can offer the prayer, with all the warmth and strength of our souls, the fasting probably, or some other sacrifice, but there are no church ceremonies. They have no effect. 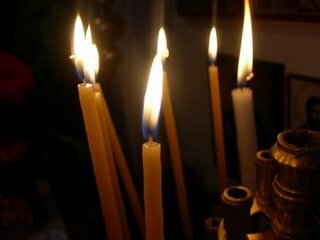 If the person departing for heaven is an orthodox christian, the first thing we do after his departure is a church ceremony, in which all of us participate, called “care” of the body of that person. During this ceremony we ask God for the first time (all of us together, as a Church (in other words, as a single body) to rest the soul of our brother “in the Light of His face”. Next, we bury the body into the ground and place a cross at the burial point, the symbol of the victory of Christ against death. We do not burn the body, because for us, although it is not holy so as to worship it, it is however worthy of respect. 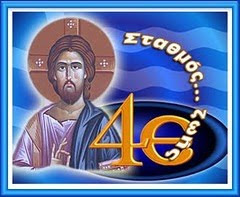 It is worth our respect because: a) Christ, the age-old God, Son of the Father-God, assumed exactly the same body as ours (we call it “homoousian” = consubstantial, from the greek words “όμο”=same + “ουσία” = substance, meaning from the same substance) and because he was the New Adam, the grace His own human body received was conveyed to all mankind, b) every christian has received personally on his own body the grace of God, since he was baptized in the name of the Holy Trinity, was chrismated with sweet oil (holy scented oil) and received the holy body and blood of Jesus, during the sacrament of the holy Communion, c) if that person has come very close to God, the holy grace is intensely present in his relics (=bones), which become “holy relics” – if we burn the body, we will deprive ourselves, the society, the whole world, from a source of holy grace, and it is possible that we will never realize that the person reached a state of Sainthood, as Sainthood is often revealed through the holy relics (which release scent, holy oil, and perform miracles). After the burial, a series of church ceremonies begins, called “commemorations” (=remembrances”) and in these also we ask God for the repose of our brother. During “commemorations”, a very small portion from the holy bread of the holy Communion is dedicated by name to the departed brother, who, in this way is commemorated in the “inside” of the holy sacrament. Commemorations are performed at the third day a person died, then at the eighth day, then at the fortieth day, then at the end of the third month, and then every three months until the completion of the first year, and then every year on the date the person died. Except from the commemorations, christians are in the habit of presenting to the priest the names of our departed ancestors and brothers, so that he can commemorate them during the holy Communion during the divine liturgy that he will celebrate on Sunday. Messages sent (with God’s permission) by departed people to living people through their dreams, reveal that this commemoration offers significant benefit to the state of the soul. 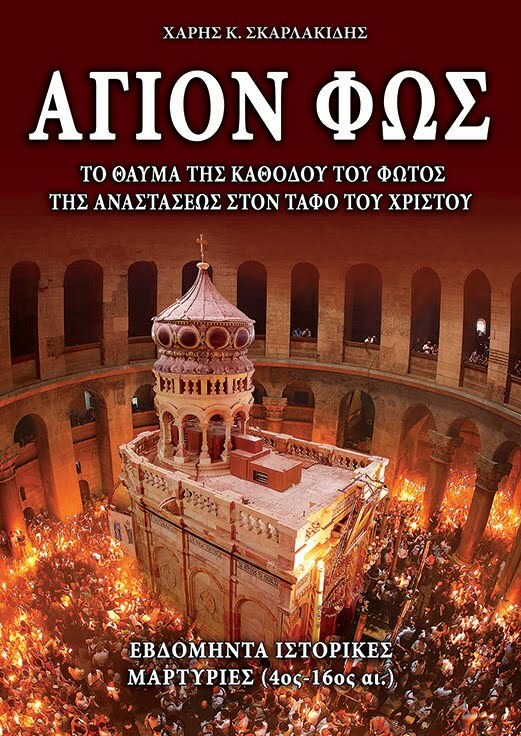 Especially, when this commemoration is done during forty consecutive divine liturgies, which is called “sarantaleitourgo” (=forty liturgies, from the greek word “σαράντα” = forty). One of the innumerable testimonies that reveal how much benefit to the souls the commemoration during the divine liturgy has, is the case of St. Theodosius Chernigoff (of Russia). 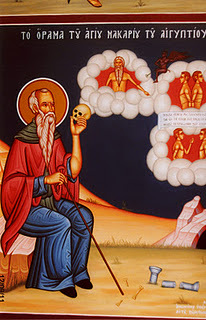 The Saint appeared to monk Alexios, who had lovingly performed the exhumation of his relics, and told him: “I thank you for getting tired for me, but I ask you to mention my parents’ names, Nikitas and Maria, during the divine liturgy.” Fr. 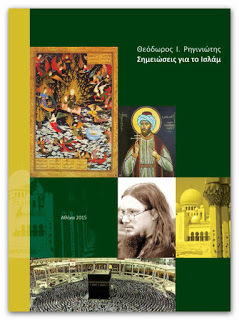 Alexios was surprised and asked him: “You, being saint and praying directly to God for everybody, you ask from me to commemorate your parents?” And the Saint answered him: “You are right, but the benefit they will have by commemorating their names inside the divine liturgy is much greater than the benefit that my prayers will offer.” When later the monastery’s book of commemorations was found, where Saint Theodosius was abbot, it was proved that his parents’ names were exactly those he had told fr. 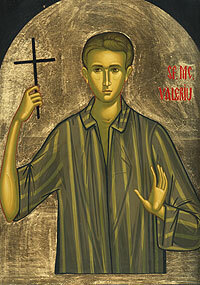 Alexios (and were previously unknown)... [from fr. Serapheim Rose The soul after death]. The church, except from the prayers for the departed sent to God in every christian ceremony, has assigned one day of the week to be specially dedicated to the commemoration of the departed (meaning the prayer for the repose of their souls) and this day is Saturday. The church has also assigned some special Saturdays to be dedicated to the commemoration of all the departed, from the beginning of the existence of the mankind on Earth until the present day. 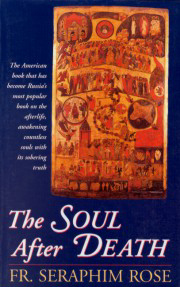 These Saturdays are named “Saturdays of the souls”. Also, a special prayer for the departed is read during the important church ceremony of the Vespers of Kneeling during the Sunday of Pentecost. Apart from the above, Christians are on the habit of privately lighting a small oil lamp as a symbol of our prayer to God, so that our departed ancestors and brothers will experience His Light with contentment. 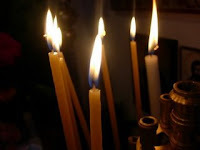 Also, we burn incense, as a symbol of our prayer, which rises to heaven like the smoke of the incense and which must smell pleasantly (meaning that the prayer must be done with pure heart, devoid of evilness, hatred, egoism, and without desire of exploitation of other people), as the smoke of the incense smells pleasantly. We dedicate cresset and incense to our beloved departed not only at home (near their pictures) but at their graves as well, which we visit whenever we want. Some times we call the priest to the grave to perform a small ritual (”trisagion”) for the repose of the departed. Are we afraid of the evil souls? Do ghosts exist? As mentioned above, the souls that foretaste paradise, in other words they have the holy grace inside them and possess some holiness (to a bigger or lesser extent), can pray to God for the protection of the living people. But the vision of St. Macarios reveals that souls foretasting hell feel completely isolated. Therefore, it is not possible in any way to return to earth and affect the lives of the living. For this reason, the christians do not believe that “bad” souls are in any way threatening to us. 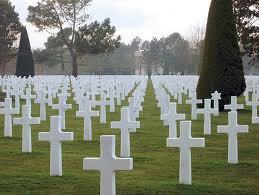 We are not afraid of them, we simply regret for their grief and suffering and pray to God for them. However, certain places seem to exist that evil spiritual powers have “engulfed” them with their dark and threatening energy. Such places are mainly those where magic rituals are, or where, performed, by invocation of demonic spirits. These spirits (ghosts) are not souls of departed people, even though sometimes they appear to be such. Similarly, the spirits appearing during “spiritual” ceremonies, during invocation of spirits by sorcerers, mediums or “spiritualists” of any kind, are not souls of dead people, either good or bad. Only with prayer, inside the life of the Church, the living address the deceased – and always address Holy people. All other cases of “communication” between dead and living, that happened and still happen for thousands of years in many civilizations and religions, are at least suspicious. We know from the experience of our holy teachers that the spirits appearing in these cases are not the souls of the dead and that generally they are not what they appear to be, but evil beings seeking to deceive by lying. A proof of the above is the fact that these spirits can become dangerous to those invoking them. And also, that in places where such invocations are repeatedly performed, evil energy is accumulated that sooner or later discharges to the lives of people. a) When a person incorporates himself and his life to the global “Body of Christ”, the Church, and receives God’s grace through the sacrament of the holy baptism, the other holy sacraments and the christian life (a life that does not include only participation to the religious ceremonies, but also includes love to our fellowmen and especially the forgiveness of our enemies), then with the help of God he can overpower the evil spiritual forces and expel their influence from his life and the life of his beloved. b) the church has special spiritual defenses to offer for this cause, like the fervent prayer invoking Jesus Christ, the placement of the Cross (through which Jesus defeated death) to the place having bad energy, the performing of special ceremonies, like exorcism, the sanctification (blessing of water, and then spraying with it), the Holy Oil (blessed oil), e.t.c. However, all these are not “magic”, to perform them and have an automatic effect. We must incorporate them to the true relation with God: they are petitions to God to come in person and help, and He will do that when we will be spiritually ready to accept His therapeutic and saving uncreated Grace. For this reason we must have patience, insistence, trust to God and, even more, repentance for the shortcomings and weaknesses that we surely possess, and ask Him to not only help us, but forgive us for whatever we do, feel, or think against His philanthropist will. The aim of the church, of the christian priests and of the christian ceremonies is not to serve earthly human needs (like exorcising evil spiritual powers from our lives). Their aim is to help us find and get to know God and help lead us to the eternal life next to Him, which is the paradise. However, within this scope, all the above provide help to our earthly problems, since these problems often impede our salvation. I conclude this talk, reminding that all spirits are less powerful than Christ (since He created them, and they chose if they want to be good [holy angels] or evil) and more powerful than people. So, the union with Christ is the proper alliance for the protection of people from all maleficient spiritual forces. Αναρτήθηκε από ΝΕΚΡΟΣ ΓΙΑ ΤΟΝ ΚΟΣΜΟ στις 4:28 μ.μ. 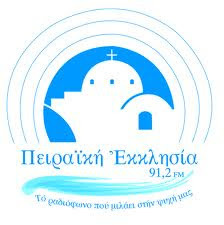 Επείγον: ψηφίστε για τη ζωή ενός μωρού!! Άγιος Νεκτάριος: "Να αγαπάμε τους αιρετικούς"